DALLAS – June 25, 2014 – UT Southwestern cancer researchers have identified a promising molecule that blocks bone destruction and, therefore, could provide a potential therapeutic target for osteoporosis and bone metastases of cancer. The molecule, miR-34a, belongs to a family of small molecules called microRNAs (miRNAs) that serve as brakes to help regulate how much of a protein is made, which in turn, determines how cells respond. UT Southwestern researchers found that mice with higher than normal levels of miR-34a had increased bone mass and reduced bone breakdown. This outcome is achieved because miR-34a blocks the development of bone-destroying cells called osteoclasts, which make the bone less dense and prone to fracture. 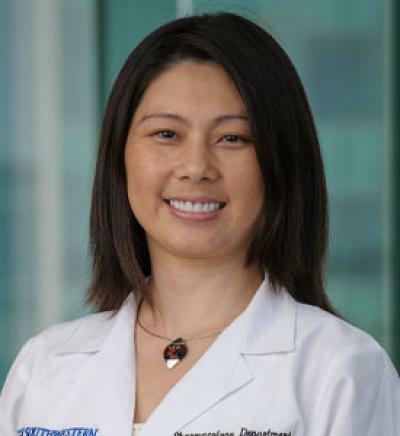 “This new finding may lead to the development of miR-34a mimics as a new and better treatment for osteoporosis and cancers that metastasize to the bone,” said senior author Dr. Yihong Wan, Assistant Professor of Pharmacology and member of the UT Southwestern Harold C. Simmons Cancer Center. Her team found that injecting nanoparticles containing an artificial version, or mimic, of miR-34a into a mouse with post-menopausal osteoporosis decreased bone loss. “Interestingly, the mouse miR-34a is identical to that in humans, which means that our findings may apply to humans as well,” said Dr. Wan, Virginia Murchison Linthicum Scholar in Medical Research at UT Southwestern. The study is published online in the journal Nature. High levels of bone destruction and reduced bone density caused by excessive osteoclasts are characteristic of osteoporosis, a common bone disease in which bones become fragile and susceptible to fracture. This condition disproportionately affects seniors and women, and leads to more than 1.5 million fractures annually. miR-34a could have an additional therapeutic application, offering protection from bone metastases in a variety of cancers, Dr. Wan noted. Bone metastases happen when cancer cells travel from the primary tumor site to the bone, establishing a new cancer location. Researchers saw that injecting the miR-34a mimic in mice could prevent the metastasis of breast and skin cancer cells specifically to bone, mainly by disarming the metastatic niche in bone. Co-author Dr. Joshua Mendell, Professor of Molecular Biology at UT Southwestern and member of the UT Southwestern Harold C. Simmons Cancer Center, noted that his laboratory previously showed that miR-34a can directly suppress the growth of cancer cells. “We were very excited to see, through this collaborative work with Dr. Wan’s group, that miR-34a can also suppress bone metastasis. Thus, miR-34a-based therapy could provide multiple benefits for cancer patients,” said Dr. Mendell, CPRIT Scholar in Cancer Research. CPRIT is the Cancer Prevention and Research Institute of Texas, which provides voter-approved state funds for groundbreaking cancer research and prevention programs and services in Texas. A new collaborative study that included the work of Wildlife Conservation Society (WCS) biologists has revealed that migratory birds that breed in Arctic Alaska are initiating nests earlier in the spring, and that snowmelt occurring earlier in the season is a big reason why. The report, “Phenological advancement in arctic bird species: relative importance of snow melt and ecological factors,” appears in the current on-line edition of the journal Polar Biology. Lead author Joe Liebezeit (formerly with WCS) and co-author Steve Zack of WCS have conducted research on Arctic birds and conservation issues in Alaska for more than a decade. Liebezeit now works for the Audubon Society of Portland. Other co-authors of the study include Kirsty Gurney of the University of Alaska Fairbanks, and Michael Budde and David Ward of the U.S. Geological Survey, Alaska Science Center. 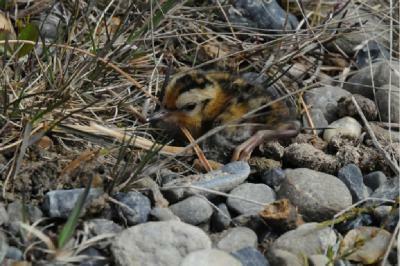 Researchers looked in nearly 2,500 nests of four shorebird species: semi-palmated sandpiper, red phalarope, red-necked phalarope, and pectoral sandpiper, and one songbird, the lapland longspur, and recorded when the first eggs were laid in each nest. The research occurred across four sites that ranged from the oilfields of Prudhoe Bay to the remote National Petroleum Reserve of western Arctic Alaska. Snow melt was assessed in nesting plots at different intervals in the early spring. 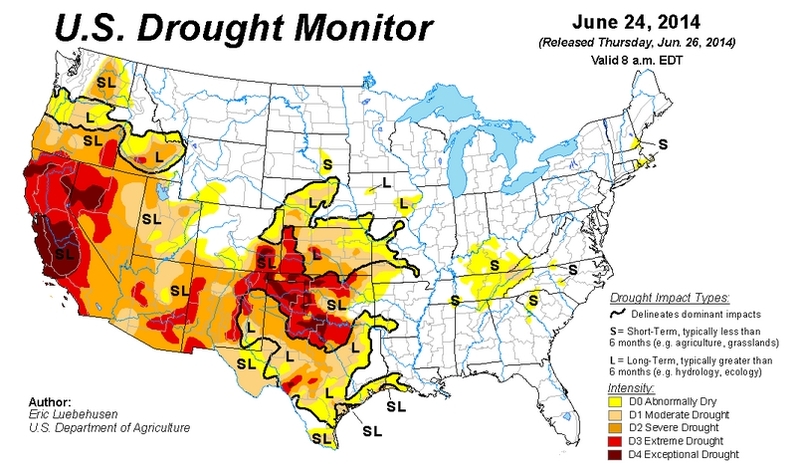 Other variables, like nest predator abundance (which is thought to affect timing of breeding), and satellite measures of “green-up”(the seasonal flush of new growth of vegetation) in the tundra were also assessed as potential drivers of the change in nest timing, but were found to be less important than snow melt. Just hatched Arctic shorebirds, like this long-billed dowitcher above, need to feed on abundant insects to grow and get ready for their southward migration in mid-summer. With earlier and earlier springs, shorebirds and other Arctic birds are challenged to adjust the timing of their breeding to insure that young have abundant resources. The birds advanced their nesting an average of 4-7 days over the nine years of the study. This pattern agrees with the general observation of 0.5 days per year observed in the scarce few other studies of nest initiation in the Arctic. The rates of change in this pattern are much higher than those observed in studies of temperate birds south of the Arctic. 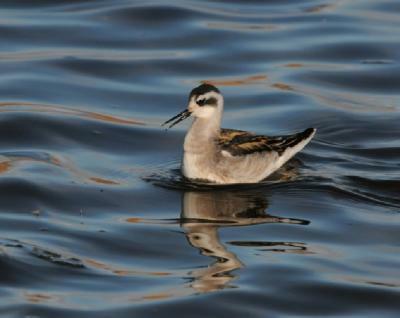 With earlier springs, Arctic Alaska shorebirds like this red-necked phalarope feeding in a small Arctic pond, need to adjust their migratory calendars to breed earlier and earlier. Such adjustments for these international migrants have unclear effects on their capacity to balance other seasonal demands in other parts of the world. (NEW YORK – June 23) A specific preparation of cocoa-extract called Lavado may reduce damage to nerve pathways seen in Alzheimer’s disease patients’ brains long before they develop symptoms, according to a study conducted at the Icahn School of Medicine at Mount Sinai and published June 20 in the Journal of Alzheimer’s Disease (JAD). Specifically, the study results, using mice genetically engineered to mimic Alzheimer’s disease, suggest that Lavado cocoa extract prevents the protein β-amyloid- (Aβ) from gradually forming sticky clumps in the brain, which are known to damage nerve cells as Alzheimer’s disease progresses. Lavado cocoa is primarily composed of polyphenols, antioxidants also found in fruits and vegetables, with past studies suggesting that they prevent degenerative diseases of the brain. The Mount Sinai study results revolve around synapses, the gaps between nerve cells. Within healthy nerve pathways, each nerve cell sends an electric pulse down itself until it reaches a synapse where it triggers the release of chemicals called neurotransmitters that float across the gap and cause the downstream nerve cell to "fire" and pass on the message. The disease-causing formation of Aβ oligomers – groups of molecules loosely attracted to each other –build up around synapses. The theory is that these sticky clumps physically interfere with synaptic structures and disrupt mechanisms that maintain memory circuits’ fitness. In addition, Aβ triggers immune inflammatory responses, like an infection, bringing an on a rush of chemicals and cells meant to destroy invaders but that damage our own cells instead. "Our data suggest that Lavado cocoa extract prevents the abnormal formation of Aβ into clumped oligomeric structures, to prevent synaptic insult and eventually cognitive decline," says lead investigator Giulio Maria Pasinetti, MD, PhD, Saunders Family Chair and Professor of Neurology at the Icahn School of Medicine at Mount Sinai. "Given that cognitive decline in Alzheimer’s disease is thought to start decades before symptoms appear, we believe our results have broad implications for the prevention of Alzheimer’s disease and dementia. Evidence in the current study is the first to suggest that adequate quantities of specific cocoa polyphenols in the diet over time may prevent the glomming together of Aβ into oligomers that damage the brain, as a means to prevent Alzheimer’s disease. The research team led by Dr. Pasinetti tested the effects of extracts from Dutched, Natural, and Lavado cocoa, which contain different levels of polyphenols. Each cocoa type was evaluated for its ability to reduce the formation of Aβ oligomers and to rescue synaptic function. Lavado extract, which has the highest polyphenol content and anti-inflammatory activity among the three, was also the most effective in both reducing formation of Aβ oligomers and reversing damage to synapses in the study mice. "There have been some inconsistencies in medical literature regarding the potential benefit of cocoa polyphenols on cognitive function," says Dr. Pasinetti. "Our finding of protection against synaptic deficits by Lavado cocoa extract, but not Dutched cocoa extract, strongly suggests that polyphenols are the active component that rescue synaptic transmission, since much of the polyphenol content is lost by the high alkalinity in the Dutching process." Because loss of synaptic function may have a greater role in memory loss than the loss of nerve cells, rescue of synaptic function may serve as a more reliable target for an effective Alzheimer’s disease drug, said Dr. Pasinetti. The new study provides experimental evidence that Lavado cocoa extract may influence Alzheimer’s disease mechanisms by modifying the physical structure of Aβ oligomers. It also strongly supports further studies to identify the metabolites of Lavado cocoa extract that are active in the brain and identify potential drug targets. In addition, turning cocoa-based Lavado into a dietary supplement may provide a safe, inexpensive and easily accessible means to prevent Alzheimer’s disease, even in its earliest, asymptomatic stages. A pipeline to carry diluent from the coast to the tar sands to dilute bitumen that would then be carried back to the coast in another pipeline for export to world markets in supertankers does not have a “sufficiently direct connection” to the tar sands? And the impacts of the tar sands and its products on climate are not relevant to the project that makes these impacts possible? What the hell? This project should never go ahead. And not just because no amount of money will undo damage from pipeline or tanker spills and accidents along the route, the B.C.coast or the ocean, or that it is opposed by First Nations and other affected communities and lacks social licence — although those are strong enough reasons to stop it. The main reasons it and other pipeline projects shouldn’t be built are the very same ones the government and joint review panel refused to consider.